Paperdoll book Saalfield#2670, 1953. 2 beautiful dolls, Suzanne; a T.V. star and Marie; a Famous Model. It is a totally uncut book. The back cover has a small water stain that does not affect doll. The 6 pages of clothes are a little wavey. Very nice book. Stor Shirley Temple påklædningsdukke ca 35 cm.Gul badedragt. Stor Shirley Temple påklædningsdukke ca 35 cm. Rød badedragt. Stor Shirley Temple påklædningsdukke ca 35 cm. Masser af flotte kostumer.Original fra 30-erne,Gul badedragt. 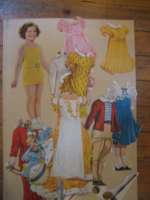 These are 3 original magazine pages for Betty Bonnet paper dolls, from 1917-1918. The first shows her College Cousins, a young boy and girl with various outfits; next has Betty going to a wedding, showing a page and flower girl with lots of different outfits (note the military and Red Cross outfits for World War I). Last is Betty's teacher--this page is black and white as you could then color the outfits yourself with watercolors. The teacher has a wide variety of outfits and hats. The pages are slightly different in size but average about 11" x 16".The price ia for the 3 paperdolls. Elisabeth Taylor paperdoll, Whittman 1956 original. Whitman#2057, 1956. Complete 8 page book cut and uncut in covers. The dolls have been punched and replaced in the covers for the photo and they both have ankle bends. The edge of the folder is worn and there is a water stain on the top of the spine area that really affects nothing. All clothes are in very good condition. 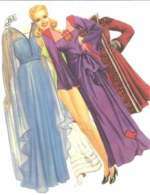 Betty Grable Moviestar paperdoll. Cut out.Old. 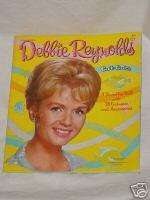 Old 1962 Debbie Reynolds Paper Doll Set made by the Whitman Publishing Company, the Authorized Edition. 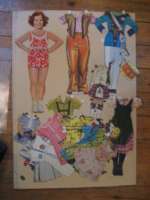 There is one 9 1/2 inch paper doll and 21 Cut Out Costumes all in very nice condition; originally there were 38 accessories. The cardboard folder which opens up to display a pool area with two chairs, flowers, shower area, and a beach ball shows very minor wear. 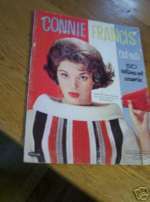 When closed the folder measures approximately 12 inches by 10 1/4 inches. The left interior section has a one inch tear to the right of the shower curtain pole, which is also the right corner of the storage area for the paper doll clothes. The back of the folder is slightly crinkled top left corner. Connie Frances paperdoll in Folder. All Original 1963. Connie Frances paperdoll in Folder. All Original 1963. Cut out clothes. Tape on nec. A rare set to find.